You’ve been asking for it, ladies and gentlemen, and now you have it: a Pingdom app for Android. 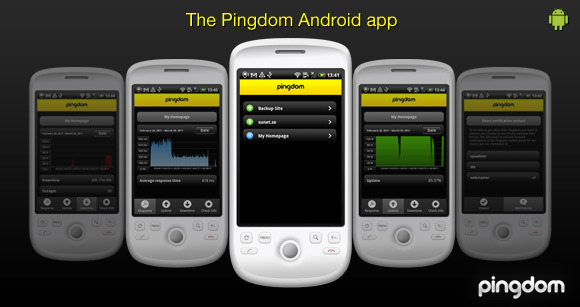 Just like our iPhone app, the Pingdom Android app is an excellent companion to the Pingdom uptime monitoring service. It lets you connect to your Pingdom account to view the status of the servers and websites you’re monitoring, and also supports alerts via push notifications. The app is free, and works together with all types of Pingdom accounts (including free accounts). 2013-12-05: We have released a brand new Android app. The main point of the Pingdom service is that you should be the first to know when your site goes down. The sooner you know about a problem, the sooner you can fix it. 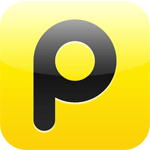 The Pingdom Android app makes it easy for you to be on top of things on the go. Get alerts directly to your Android phone. Get information about each check, such as its monitoring resolution, check type (HTTP, Ping, DNS, SMTP, IMAP, POP3, TCP port, etc.) and target (IP address or URL). It might be worth pointing out that push notifications (a.k.a. cloud notifications) require Android 2.2 or later (because that’s when Google added a push notification service). To use the Android app you first need to have a Pingdom account. You can learn more about our uptime monitoring service at www.pingdom.com, where you can also sign up for a free account. And actually, you can even sign up for a free account from within the app if you want to. It’s that easy. Finally! Thank you a million times over. Very nice! Thank you for this. Are there any plans for supporting multiple user accounts in the app? Does it support multiple accounts? Yes! You guys just made my day! Android FTW. And when will a Blackberry app be released? Excellent (and about time)! Working well. This app is very cool. The only thing I’m missing is the landscape mode for the Tablet. Windows Phone 7 app, please? @ivan: Are you 100% sure there are no typos in either your username or password? Thank you Pingdom! Also, thank you to those who posted the QR codes. hmm.. not working on my Motorala Dext either (android 1.5). Having problems similar to the one ivan reported. When logging onto the app I keep getting login credential errors but can log on fine to the website using exactly the same values. Please consider adding support for multiple accounts in the app. When will there be an update to android 2.3.3 and qhd support? This app is good, but it needs alarm sounds rather than using the standard Android notification. I want to be able to switch off all notifications except Pingdom – so it’s the only thing that wakes me in the middle of the night. @Al1stair Same here – pls allow configuration of the notification noise pls!